In this research release PRDnationwide National Research Manager Dr Diaswati Mardiasmo presents key insights into the current Gold Coast property market and the Commonwealth Games 2018. Dr Mardiasmo has been tracking the impact of major sporting events on their host cities since 2015. As the Gold Coast waits with bated breath for the start of the most anticipated international sporting game it has ever hosted, keen property watchers are increasingly wondering what will happen to the Gold Coast property market once the Commonwealth Games 2018 has concluded. At present, the Gold Coast property market is showing healthy signs of price growth, with houses recording a 6.9% growth and units recording a 4.2% growth over the past 12 months (2016 to 2017). There has also been a 2.5% growth in the number of units sold during this period. This growth combined with positive price changes suggest real capital growth in the market. From a perspective of capital cost and potential investment return, the Gold Coast gives more “bang for your buck”, as it has a lower median entry price (for both houses and units) compared to Sydney, Brisbane, and Melbourne; as well as higher rental yields and lower vacancy rates (for both houses and units). This makes investing into the Gold Coast a ‘no brainer’. These findings should comfort those who might be wary of a unit oversupply in the Gold Coast in general. What’s more, the average days on market for both houses and units have decreased, suggesting there is more competition in the market, even before the Commonwealth Games, and that buyers need to secure properties now. The question of 'what will happen after the Commonwealth Games' is a focal point to property buyers and investors, particularly concerns around the post-Games period and the market potentially seeing a cooling down. The Games will primarily take place in the suburbs of Ashmore, Broadbeach, Broadbeach Waters, Carrara, Coomera, Oxenford, Runaway Bay, and Southport. At present the suburbs set to feel the most impact are Carrara, Oxenford, and Southport, with these suburbs already recording annual house price growth that surpasses the Gold Coast Local Government Area (LGA), at 9.2%, 8.2%, and 8.5% respectively. Coomera has become a stand out suburb for unit investment, with an annual price growth of 11.3%. What’s more, transaction growth in most of the affected suburbs have declined over the past 12 months, suggesting an undersupplied market. Post the Melbourne Commonwealth Games 2006, Parkville and its surrounding suburbs where the Games were held saw positive outcomes in the property market. Sales transactions rose over 33.0% in the year after the Games were held and prices increased by 11.4%. 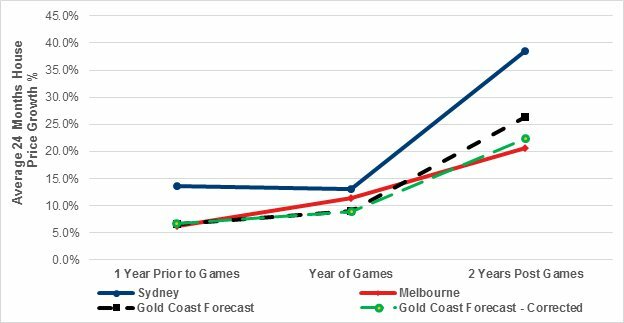 What is more prevalent, is that median prices around the area continued to increase 2 years after the Games finished, by 20.6%. The same can be learned from the Sydney Olympics 2000 and how it impacted Newington and its surrounding suburbs. During the year of the Olympics, median house prices increased by 13.1% and 2 years post-Olympics median prices increased by 38.6%. Should the market continue to go the same direction that it is going now, more owners, investors, and university students will come to the Gold Coast post-Commonwealth Games. Now is the time to get into the market and capitalize on higher levels of affordability.